People are divided on what the future will look like with robots in the public domain. While some see robots as humanoid creatures that steal jobs from us, many find them fascinating and dream of a future with robots. 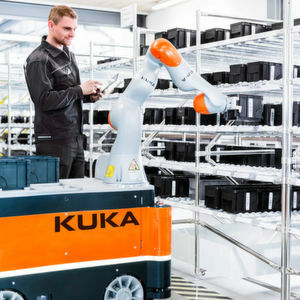 We at KUKA have a very clear vision: robots should assist people, not the other way around. Robots can help people with their work, relieving them of unpleasant or non-ergonomic tasks. The tasks carried out by people should preferably be limited to those requiring human skills such as the ability to learn, learning from experience, sensory perception, creativity, improvisation, etc. Robots can complement these human virtues with power, repeatability, speed and quality..
For us at KUKA, human-robot collaboration (HRC) also means responsibility. People are always the central focus – robots are there to help people and must never endanger them. To do so, robots must comply with new safety requirements. There are of course various ways to deal with these requirements. At KUKA, we draw a distinction between safety functions in place to protect people when they are working with a robot, and functions that make the robot itself safe. The robot stops when the safety gate to the robot is opened. All that is needed for this variant is a safe input (a safety relay if necessary) that stops the robot when somebody enters the area. If the use of one safe sensor can (just as safely) determine the location of the person, the robot velocity can be reduced according to the distance between the person and the robot to ensure that the robot is always at standstill when the person reaches it. For this variant, the robot needs the “safe velocity monitoring” safety function and a safe input for the Emergency Stop button. The basis for all current HRC robot systems is collision avoidance. The ultimate challenge and the true essence of human-machine collaboration is collision control (“power and force limitation”). This involves the robot being able to interact with the person – the person can touch the robot, guide it, and even collide with it. Using functions such as safe collision detection or safe force monitoring, it must then be ensured that forces and pressures do not exceed defined, safe limits in the event of a collision, regardless of the operation situation. Shortly spoken, that the robot does not hurt the human.